The second weekend of action in the Senior British National Leagues proved to be fruitful for both Ravenscroft teams with each undefeated over the course of the eight matches. Ravenscroft I were the more impressive as they mirrored their perfect start in September with another four wins, leaving them two points clear at the top of Division Four North. Ravenscroft II won two and drew two of their matches against strong opposition, results that leave them joint second with two other sides in Division Four South. games. The Warrington No. 1, Paul Hutchings, was instrumental in giving his side a chance as his matching five-set wins over Joshua Stacey and Joshua Butler left the Guernsey side facing a 3-2 deficit. Butler made no mistakes in his other five-setter during the early stages of the match in which he overcame Mark Bleakley 11-9 in the decider. Alex Robinson (pictured) was the other player to take a win after his four game victory over David Eden. From 3-2 down, it was Stacey who started the fightback with a comprehensive straight game win over Olivier Barthelemy, who had earlier beaten Ben Foss in four. Robinson again showed good composure to see off Bleakley in four and Foss made no mistakes during his encounter with Eden in the final match, a four-game success completing the comeback victory. The afternoon fixture was a much more comfortable affair for the Sarnian outfit who cruised to an 8-0 whitewash over North Ayrshire. The closest match came between Butler and Andrew Macpherson in a rubber where Macpherson cameback from 2-0 down before Butler made a strong start to the decider and cruised through 11-4. Sunday saw another comfortable victory obtained, Halton TTC the side to be beaten 7-1. Foss did well to come back from 2-1 down to beat Bethany Farnworth over the full five-game distance, the crucial fourth end won 15-13. Peter Walsh junior prevented the whitewash with his five-game win over Stacey. The match also saw straight game wins for Stacey and Robinson over Team GB Paralympic athlete Jack Hunter-Spivey. The final match of the weekend resulted in a 6-2 win over Drumchapel Glasgow IV. Robinson again showed his class and ensured that he finished another weekend unbeaten, due to straight-game wins over Martin Perry and Thomas Cairns. Stacey was another player to take two wins and his first was a highly impressive five-game win over the second best Scottish under-18 player, Yazer Razouk. Butler took out Cairns in straight games, but he was unable to overcome Razouk, with the Glasgow-based player winning in four. Foss started the match well with a straight-game win over Stuart Horsfall, but he lost out in the final match of the weekend to Perry 12- 10 in the deciding game. mark for the weekend with a straight-game win over Hodges and Paul Hainsworth and Dawn Morgan ensured the win was obtained with both defeating the White Horses No. 3, David Walton, in four. in five. His other win came in four games against Dmitry Bardysh, the same player that denied the Guernsey side the win due to his five-game win over Morgan, agonisingly 13-11 in the deciding end. Robilliard beat Theodore Achampong in four and the deciding game of the match was between Morgan and Achampong, with the hosts leading 4-3. Morgan came through the opening two games strongly and looked set to seal it when leading 9-5 in the third. Achampong battled back to take the third, but this did not deter Morgan who managed to clinch a tight fourth end and a well-deserved point. Sunday morning started where Saturday afternoon left off with another tough fixture against the previously unbeaten Greenhouse III team. The match finished as a 4-4 draw and Robilliard was the best local performer due to his straight game wins over Anthony Patten and Ovigwe Eyarhano. 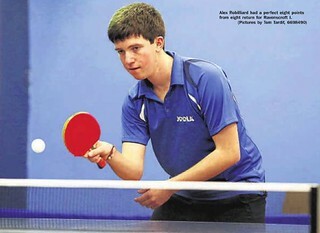 Hainsworth and Morgan secured the point due to their wins over Max Aldous in straight and four games respectively. Hainsworth and Stacey did their best against the previously unbeaten Greenhouse coach and No. 1 Tony Wilkinson, but each went down in four. straight games. The match featured some of the best table tennis of the weekend. The Thai player's unorthodox flat hitting off both wings was proving tricky for Robilliard, a narrow 16-14 third game giving the youngster a 2-1 lead. But Robilliard weathered the storm superbly during the fourth as he cruised through 11-4 with some top quality shots. The decider was a nervy affair and Robilliard successfully saved a match point at 9-10 before emerging victorious 12-10. This was a big result as the remaining two rubbers were ones that strongly favoured the Ravenscroft side. Hainsworth was first up against the Stukeley No. 3, James Kelly, a player he had beaten comfortably during the opening weekend and whom Morgan had recently beaten in straight games. Kelly did not read the script and played some exceptional table tennis to open up a two-game lead with his carefree hit-and-hope attitude working to good effect. Hainsworth was determined not to go down without a fight following Robilliard's efforts in the previous encounter and he came through the next two games with few problems. These efforts appeared to have gone to waste in the decider which started disastrously for the visibly frustrated Guernsey player, a 6-0 deficit soon turning to 7-1 - the Great Stukeley player just four points from the win. Hainsworth was not about to let the game slip away and he kept his composure well in reeling the scores back to parity at 8-8. A time-out from the Great Stukeley player at this stage did not have the desired effect as Hainsworth continued his momentum to lead 10-8. The first match point went begging, but no mistake was made on the next, an incredible comeback win obtained 11-9. Morgan also came up against a player who performed above his usual standard, but she had enough experience to come through in four against Ringer-Duffy to ensure that the weekend ended on a high. Two further fixtures will be contested on 18 January and both sides will be looking to sustain their momentum in their push towards promotion.